The Alans or Alani (occasionally but more rarely termed Alauni or Halani) were an Iranian nomadic group among the Sarmatian people, warlike nomadic pastoralists of varied backgrounds, who spoke an Iranian language and to a large extent shared a common culture. The various forms of Alan — Greek: Αλανοί, Αλαννοί; Chinese: 阿蘭聊 Alanliao (Pinyin) in the 2nd century CE, Alan (Pinyin) in the 3rd century CE — and Iron (a self-designation of the Alan's modern Ossetian descendants, etymologically unrelated to the metal iron) are Iranian dialectical forms of Aryan. These and other variants of Aryan (such as Iran), were common self-designations of the Indo-Iranians, the common ancestors of the Indo-Aryans and Iranian peoples to whom the Alans belonged. The Alans were also known over the course of their history by another group of related names including the variations Asi, As, and Os (Hungarian Jász, Russian Jasy, Georgian Osi). It is this name which is the root of the modern Ossetian. "and consequently they could import on camels the Indian and Babylonian merchandise, receiving it in their turn from the Armenians and the Medes, and also, owing to their wealth, could wear golden ornaments. Now the Aorsi live along the Tanaïs, but the Siraces live along the Achardeüs, which flows from the Caucasus and empties into Lake Maeotis." "The kingdom of Yancai [literally "Vast Steppe"] has changed its name to the kingdom of Alanliao. They occupy the country and the towns. It is a dependency of Kangju (the Chu, Talas, and middle Jaxartes basins). The climate is mild. Wax trees, pines, and ‘white grass’ [aconite] are plentiful. Their way of life and dress are the same as those of Kangju." The Chinese li of the Han period differs from the modern SI base unit of length; one li was equivalent to 415.8 metres. The "Great Shoreless lake" probably referred to both the Aral and Caspian seas. The mouth of the Syr Darya or Jaxartes River which emptied into the Aral Sea was approximately 850 km northwest the oasis of Tashkent which was an important centre of the Kangju confederacy. This provides remarkable confirmation of the account in the Shiji. By the beginning of the 1st century, the Alans had occupied lands in the northeast Azov Sea area, along the Don and by the 2nd century had amalgamated or joined with the Yancai of the early Chinese records to extend their control all the way along the trade routes from the Black Sea to the north of the Caspian and Aral seas. The written sources suggest that from the second half of the 1st to 4th century the Alans had supremacy over the tribal union and created a powerful confederation of Sarmatian tribes. The Alans presented a serious problem for the Roman Empire, with incursions into both the Danubian and the Caucasian provinces in the 2nd and 3rd centuries. Ammianus Marcellinus stated that: Almost all of the Alans are tall and good looking; their hair is generally blond, and their eyes are frighteningly fierce. Ammianus Marcellinus considered the Alans to be the former Massagetae: cf. "iuxtaque Massagetae Halani et Sargetae", "per Albanos et Massagetas, quos Alanos nunc appellamus", "Halanos pervenit, veteres Massagetas". Archaeological finds support the written sources. Late Sarmatian sites were first identified with the historical Alans by P.D. Rau. Based on the archaeological material, they were one of the Iranian-speaking nomadic tribes that began to enter the Sarmatian area between the middle of the 1st and the 2nd century. The Alani were first mentioned in Roman literature in the 1st century and were described later as a warlike people that specialized in horse breeding. They frequently raided the Parthian empire and the Caucasian provinces of the Roman Empire. In the Vologeses inscription  one can read that Vologeses, the Parthian king, in the 11th year of his reign, battled Kuluk, king of the Alani. "4.Now there was a nation of the Alans, which we have formerly mentioned somewhere as being Scythians, and inhabiting at the Lake Meotis. This nation about this time laid a design of falling upon Media, and the parts beyond it, in order to plunder them; with which intention they treated with the king of Hyrcania; for he was master of that passage which king Alexander shut up with iron gates. This king gave them leave to come through them; so they came in great multitudes, and fell upon the Medes unexpectedly, and plundered their country, which they found full of people, and replenished with abundance of cattle, while nobody durst make any resistance against them; for Pacorus, the king of the country, had fled away for fear into places where they could not easily come at him, and had yielded up everything he had to them, and had only saved his wife and his concubines from them, and that with difficulty also, after they had been made captives, by giving them a hundred talents for their ransom. These Alans therefore plundered the country without opposition, and with great ease, and proceeded as far as Armenia, laying all waste before them. Now Tiridates was king of that country, who met them, and fought them, but had like to have been taken alive in the battle; for a certain man threw a net over him from a great distance, and had soon drawn him to him, unless he had immediately cut the cord with his sword, and ran away, and prevented it. So the Alans, being still more provoked by this sight, laid waste the country, and drove a great multitude of the men, and a great quantity of the other prey they had gotten out of both kingdoms, along with them, and then retreated back to their own country." Flavius Arrianus marched against the Alani in the 1st century and left a detailed report (Ektaxis kata Alanoon or 'War Against the Alans') that is a major source for studying Roman military tactics, but doesn't reveal much about his enemy. Around 370, the Alans were overwhelmed by the Huns. They were divided into several groups, some of whom fled westward. A portion of these western Alans joined the Germanic tribes of Vandals and Sueves in their invasion of Roman Gaul. Gregory of Tours mentions in his Liber historiae Francorum ("The book of the history of the Franks") that the Alan king Respendial saved the day for the Vandals in an armed encounter with the Franks at the crossing of the Rhine on December 31 406). According to Gregory, another group of Alans, led by Goar, crossed the Rhine at the same time, but immediately joined the Romans and settled in Gaul. Following the fortunes of the Vandals and Suevi into the Iberian peninsula (Hispania) in 409, the Alans settled in the provinces of Lusitania and Carthaginiensis: "Alani Lusitaniam et Carthaginiensem provincias, et Wandali cognomine Silingi Baeticam sortiuntur" (Hydatius). The Siling Vandals settled in Baetica, the Suevi in coastal Gallaecia, and the Asding Vandals in the rest of Gallaecia. In 418, the Alan king, Attaces, was killed in battle against the Visigoths, and this branch of the Alans subsequently appealed to the Asding Vandal king Gunderic to accept the Alan crown the separate ethnic identity of Respendial's Alans dissolved. Although some of these Alans are thought to have remained in Iberia, most went to North Africa with the Vandals in 429. Later Vandal kings in North Africa styled themselves Rex Wandalorum et Alanorum (King of the Vandals and Alans). In Gaul, the Alans originally led by Goar settled in several areas, notably around Orléans and Valentia. Under Goar, they allied with the Burgundians led by Gundaharius, with whom they installed the usurping Emperor Jovinus. Under Goar's successor Sangiban, the Alans of Orléans played a critical role in repelling the invasion of Attila the Hun at the Battle of Chalons. After the fifth century, however, the Alans of Gaul were subsumed in the territorial struggles between the Franks and the Visigoths, and ceased to have an independent existence. Flavius Aëtius settled large numbers of Alans in and around Armorica in order to quell unrest. The Breton name Alan (rather than the French Alain) and several towns with names related to 'Alan', such as Alanville are popularly taken as evidence that a contingent settled in Brittany. In the Iberian peninsula the Alans settled in Lusitania and the Cartaginense provinces. They became known in retrospect for their massive hunting and fighting dog, the Alaunt, which they apparently introduced to Europe. The breed is extinct, but its name is carried by a giant breed of dog still called Alano that survives in the Basque Country. The dogs are traditionally used in boar hunting and cattle herding. Modern genetic science's disclosure of the geographical distribution of historical genetic markers has convinced certain theorists of the connection between Sarmato-Alanic deep ancestral heritage in Europe and the Y-DNA paternal Haplogroup G (Y-DNA), specifically G2. Alan tribes living north of the Black Sea may have moved northwest into what is now Poland, merging with Slavic peoples there to become the precursors of historic Slav nations (notably Serbs and Croats). Third-century inscriptions from Tanais, a town on the Don River in modern Russia, mention a nearby Alan tribe called the Choroatos or Chorouatos. The historian Ptolemy identifies the 'Serboi' as a Sarmatian tribe who lived north of the Caucasus, and other sources identify the Serboi as an Alan tribe in the Volga-Don steppe in the third century. Accounts of these names reappear in the fifth century, with the Serboi, or Serbs, established east of the river Elbe in what is now western Poland, and the Croats in what is now Polish Galicia. The Alan tribes likely moved northeast and settled among the Slavs, dominating and mobilizing the Slavic tribes they encountered and later assimilating into the Slav population. In 620 the Croats and Serbs were invited into the Balkans by Eastern Roman Emperor Heraclius to drive away the Turkic Avars, and settled there among earlier Slavic migrants to become ancestors of the modern Serbs and Croats. Some Serbs remained on the Elbe, and their descendants are the modern Sorbs. Tenth-century Byzantine and Arab accounts describe a people called the Belochrobati (White Croats) living on the upper Vistula, an area later called Chrobatia. Some of the other Alans remained under the rule of the Huns. These 'eastern' Alans are said to be ancestors of the modern Ossetians of the Caucasus. Those of the eastern division, though dispersed about the steppes until late medieval times, were forced by the Mongols into the Caucasus, where they remain as the Ossetians. Their most famous leader was Aspar, the magister militum of the Byzantine Empire during the 460s. They formed a network of tribal alliances between the ninth and twelfth centuries. In the 8th century a consolidated Alan kingdom, referred to in sources of the period as Alania, emerged in the northern Caucasus Mountains, roughly in the location of modern Circassia and North Ossetia-Alania. Its capital was Maghas, and it controlled the vital trade route through the Darial Pass. 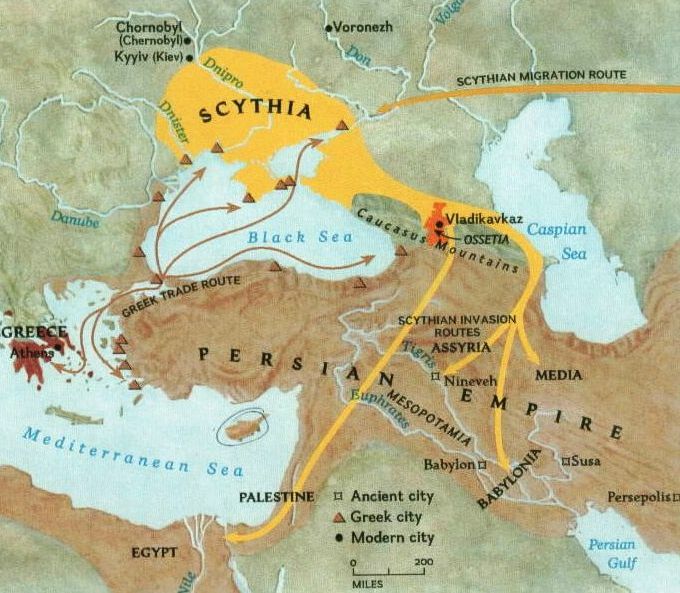 At times it had an outlet to the sea via the ancient port city of Phasis in Colchis (western Georgia). In the 800s, the Alan kingdom in the Caucasus fell under the overlordship of the Khazar Khaganate. They were staunch allies of the Khazars, supporting them against a Byzantine-led coalition during the reign of the Khazar king Benjamin. According to the anonymous author of the Schechter Letter, many Alans were during this period adherents of Judaism. However, in the early 900s, the Alans fell under the influence of the Byzantine Empire, possibly due to the conversion of their ruler to Christianity. The Byzantines, who had adopted an anti-Khazar foreign policy, involved the Alans in a war against the Khaganate during the reign of the Khazar ruler Aaron II, probably the early 920s. In this war the Alans were defeated and their king captured. According to Muslim sources such as al-Mas'udi, the Alans abandoned Christianity and expelled the Byzantine missionaries and clergy roughly contemporaneously with these events. Aaron's son married the daughter of the Alan king and Alania was re-aligned with the Khazars, remaining so until the collapse of the Khaganate in the 960s. Thereafter, the Alan kings frequently allied with the Byzantines and various Georgian rulers for protection against encroachments by steppe people such as the Pechenegs and Kipchaks. Their alliance with Georgia culminated in 1187, when the Alanian prince David Soslan married Queen Thamar. The medieval Alanian princesses also married Russian Rurikid rulers more than once. For instance, St Maria the Ossetian, who founded the Convent of Princesses in Vladimir, was the wife of Vsevolod the Big Nest and grandmother of Alexander Nevsky. In the 4th–5th centuries the Alans were at least partially Christianized by Byzantine missionaries of the Arian church. In the thirteenth century, fresh invading Mongol hordes pushed the eastern Alans further south into the Caucasus, where they mixed with native Caucasian groups and successively formed three territorial entities each with different developments. Around 1395 Timur's army invaded Northern Caucasus and massacred much of the Alanian population. As the time went by, Digor in the west came under Kabard and Islamic influence. It was through the Kabardians (an East Circassian tribe) that Islam was introduced into the region in the 17th century. Tuallag in the southernmost region, Georgian Samachablo, became once again part of what is now Georgia, and Iron, the northernmost group, came under Russian rule after 1767, which strengthened Orthodox Christianity considerably. Most of the Ossetes today are Eastern Orthodox Christians. The linguistic descendants Alans, living in the autonomous republics of Russia and Georgia, speak the Ossetic language, which belongs to the Northeastern Iranian language group, being the only remnant of the Scytho-Sarmatian dialect continuum which once stretched over much of the Pontic steppe and Central Asia. Modern Ossetic has two major dialects: Digor, spoken in the western part of North Ossetia; and Iron, spoken in the rest of Ossetia. A third branch of Ossetic, Jassic (Jász), was formerly spoken in Hungary. The literary language, based on the Iron dialect, was fixed by the national poet, Kosta Xetagurov (1859–1906). There is a small community in Western Iraq calling itself Alani. They seem to have Turkish or Iranian ancestry, and are Sunni Muslims. The name Alani was probably adopted by these people to claim ancestry from the legendary Alan Iranian tribe; however, they are largely arabized. They do present many racial similarities with the Caucasians. They use the name Alani as a surname. Its not uncommon to find red or blond hair among them, however as intermarriage with the Arabs became common, now they have a variety of phenotypes, some show to have Mongolian features; this is in fact support that they do have Altaic ancestry rather than Iranian, since Turkish tribes have large amounts of Mongolian blood. They have been linked to the ten lost tribes of Israel, the Huns, Khazars, and of course the Tatar army of Hulagu khan when the Mongols entered Iraq. The later theory was introduced by Shiites who despise Alanis as they are Sunni. Extremist Shiites use derogatory terms such as "pigs" and "unclean dogs that must be exterminated" to address them. The historical connection to the Alans is based on legends and assumptions. Racially they are different from the Semitic Arabs, seeming to be of the Altaic branch, and probably came from Siberia and Central Asia in the year 487 AD according to their legend that states they came from the north of the Caucasus, and eastern Tabristan which is probably Turkestan. Some have linked them to the Persians who also used the name. 4. Hill, John E. 2003. "Annotated Translation of the Chapter on the Western Regions according to the Hou Hanshu." Revised Edition - to be published soon. • Golb, Norman and Omeljan Pritsak. Khazarian Hebrew Documents of the Tenth Century. Ithaca: Cornell Univ. Press, 1982. • Yu, Taishan. 2004. A History of the Relationships between the Western and Eastern Han, Wei, Jin, Northern and Southern Dynasties and the Western Regions. Sino-Platonic Papers No. 131 March, 2004. Dept. of East Asian Languages and Civilizations, University of Pennsylvania.